We have been successfully using Cypress to verify our websites and web apps for a while. Here are some tips & tricks we have learned. Cypress has excellent documentation at https://docs.cypress.io/, including examples, guides, videos and even a busy Gitter chat channel. There is also "Search" box that quickly finds relevant documents. Recently common recipes were combined into a single place. If you still have an issue with Cypress, please search through open and closed issues. You can also read my other blog posts about Cypress under tags/cypress. As long as the project has a project key, you can run the tests on your own CI boxes. I found running inside Docker to be the easiest, and even built an unofficial Docker image with all dependencies. Note that cypress ci ... will upload recorded videos and screenshots (if capturing them is enabled) to the Cypress cloud, while cypress run ... will not. When Cypress team has released the video capture feature in version 0.17.11 it quickly became my favorite. 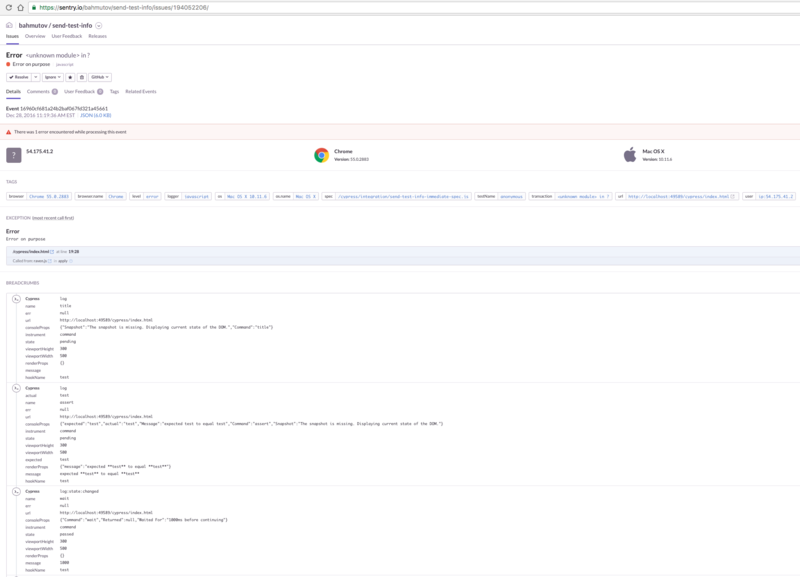 I have configured our GitLab CI to keep artifacts from failed test runs for 1 week, while keeping videos from successful test runs only for a 3 days. Whenever a test fails, I watch the failure video side by side with the video from the last successful test run. The differences in the subject under test are quickly obvious. Testing code should be engineered as well as the production code. To avoid duplicating testing helper utilities, we advise to move all common helpers into their own NPM module. For example, we use local CSS styles with randomized class names in our web code. This makes the selectors very long since we need to use prefixes. By creating a tiny helper function we alleviated the selector head aches. The test code became a lot more readable. Using a single cypress/integration/spec.js file to test a large web application quickly becomes difficult and time consuming. We have separated our code into multiple files. Additionally, we keep the source files in src folder and build the multiple bundles in cypress/integration using kensho/multi-cypress tool. The multi-cypress tool assumes that Docker and GitLab CI are used to actually run the tests. Each test will be inside its own "test job", thus 10 spec files can be executed at once (assuming at least 10 GitLab CI runners are available). The command to run a specific spec file is cypress run --spec "spec/filename.js" by the way. As I have said before, the true value of a test is not when it passes, but when it fails. Additionally, even a passing test might generate client-side errors that are not crashes and do not fail the test. For example, we often use Sentry exception monitoring service where we forward all client-side errors. 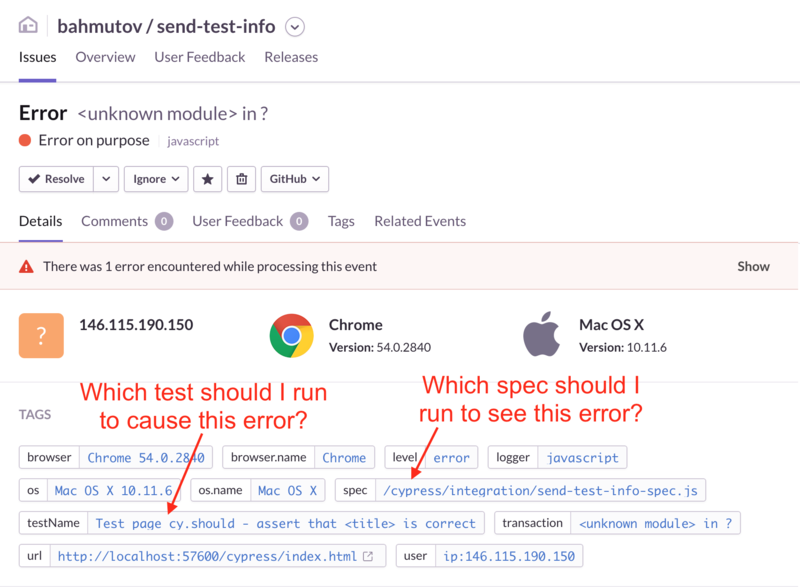 If a client-side error happens while the E2E Cypress test is running, we need this additional context: which test is executing, what steps were already finished before the error was reported, etc. Similarly, the Cypress test steps are logged as breadcrumbs and are sent with the exception allowing any developer to quickly get a sense when the error happens as the test runs. Often as part of the E2E test we create items / users / posts. I like to put the full test title in the created data to easily see what test created which datum. Inside the test we can quickly grab the full title (which includes the full parent's title and the current test name) from the context. // name will be "test name: foo bar - <random>"
You can pause the test execution by using debugger keyword. Make sure the DevTools are open! If you separate Cypress E2E tests into multiple spec files, you soon end up with lots of files. If you need to run the scripts one by one from the command line, I wrote a small utility run-each-cypress-spec. While videos of the failed tests are useful, sometimes we just want to get a sense of the failure before triaging it. In the headless CI mode, you can get a JSON file for each failed test with the log of all commands. See the JSON file below as an example of a failed test and the file it generated. [type='submit'][value~='Join Us']** to exist in the DOM"
This is a separate project that just needs to be included from your cypress/support/index.js file. For instructions see cypress-failed-log project. But sometimes it does not work. When we cy.get('.list') Cypress saves the DOM element as the "subject" and then tries to wait for a child of that element with text "Hello" to become visible. If we use React for example, the DOM of the list might be recreated from scratch if we push a new item into the list. When that happens Cypress notices that the "subject" DOM it holds a reference to becomes "detached from the DOM" - it becomes an orphan! A better solution to this problem is to use a composite CSS selector that will grab the list AND the item in a single operation. This forces Cypress to wait for the list AND list item element without caching a reference to the DOM element .list. You can write files to disk directly from Cypress using cy.writeFile and read an existing file using cy.readFile. What if you want to read a file that might not exist? cy.readFile will fail the test if file does not exist, thus we need to find a work around. In my case, the file I would like to load is a JSON of test values useful for Jest-like snapshot testing. Here is a neat trick. Save the file using cy.writeFile, for example cy.writeFile('spanshots.json') whenever there is something to save. When reading the file, fetch it through the Cypress code proxy using fetch Notice how the test spec itself is served by Cypress from URL which looks like http://localhost:49829/__cypress/tests?p=cypress/integration/spec.js-438. Let us "hack" it to load a file that might not exist. The code below tries to load snapshots file before each test. If the fetch call fails, the file does not exist. Here is how built-in Cypress bundler returns it in response to /__cypress/tests?p=./snapshots.json - I have shortened the webpack boilerplate preamble. Boom, the object snapshots has been loaded from the file snapshots.json which might or might not exist. Note while I have successfully used the above hack when running Cypress locally, it was always failing when doing cypress run in headless mode. Sometimes you might need to interact with a page element that does not always exist. For example there might a modal dialog the first time you use the website. You want to close the modal dialog. The above check is safe. Read Cypress Halloween Theme and check out cypress-dark plugin. Instead we can use .then after waiting for the network request. It is also helpful to print the message when checking for the token, otherwise command log simply says "expect null to equal null". Every Cypress command is automatically inserted into the queue, so you can iterate over the items and use Cypress commands, everything will be queued correctly. I prefer cy.first() to cy.eq(0).